My mailbox has been buzzing lately with all sorts of good mail. 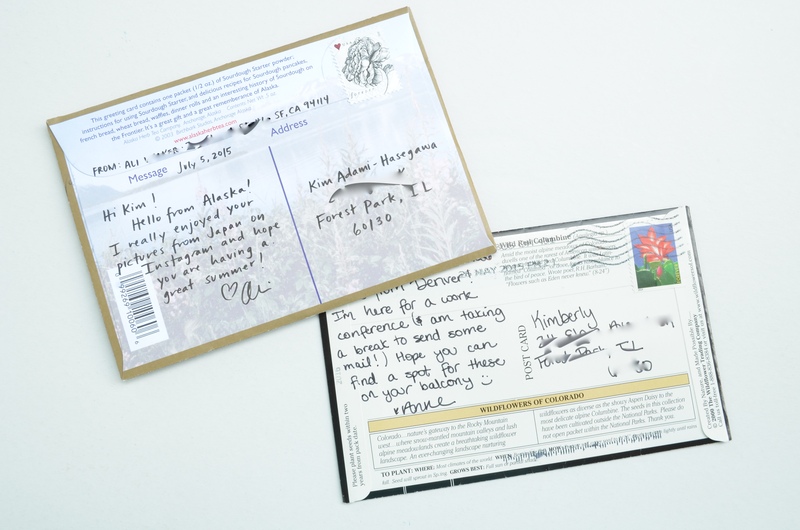 Two of my pen pals sent interesting travel postcards this month. I’ve never seen this “mailable souvenir” concept before but now I think I’ll be keeping my eye out for something like it next time I travel. Anne sent the Wildflowers of Colorado postcard. It’s a postcard-sized seed packet with Wild Red Columbine inside. I’m looking forward to winter sowing them for next summer! 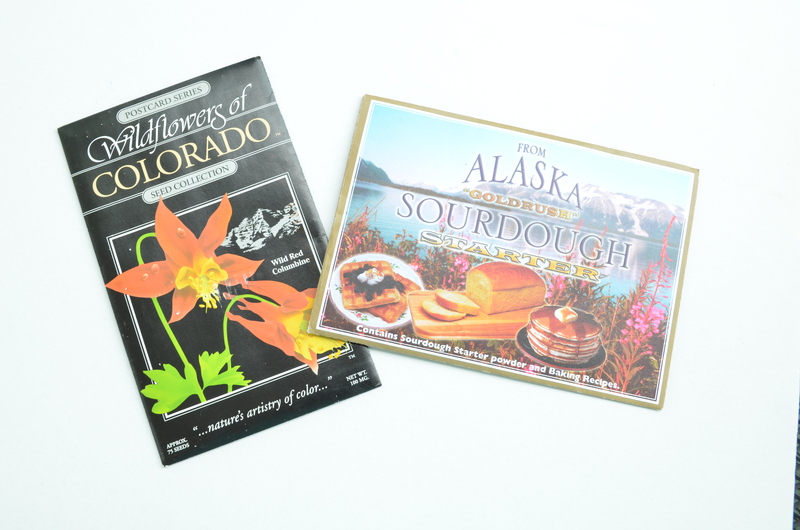 And Ali sent a postcard packet of sourdough starter from Alaska. I’ve been wanting to make sourdough bread for years, so this is the perfect excuse to try! Have you ever seen anything like this when you’ve been shopping for postcards? I want to know what other fun things are out there! Thanks for the good mail, Anne & Ali! Wow, these are so neat! I’ve never seen anything like that before. Those are fantastic, Samuel! I love the tea images they used, too! Thanks for sharing. I work for a museum in Denver that sells those. I always wonder how many people mail theirs. Oh fun, Lauren! It’s such a great souvenir! Annie, that is so fun! I hope you don’t mind but I linked to your post with that postcard. I wonder if Salt Lake City still makes them? I’ve been thinking a lot about what would/should be on a Chicago postcard…or a Forest Park postcard…I haven’t come up with any good ideas though. I don’t mind a bit! 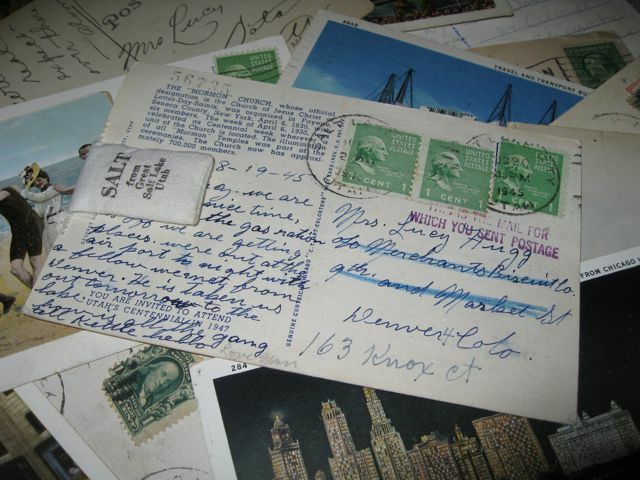 The postcard rate in 1945 was one cent, but the salt postcard had three cents of postage; the postage today would also above and beyond the regular postcard rate. Whether they still exist might depend on if today’s postcard senders think the novelty outweighs the cost of sending them! I don’t know Chicago, so I have no suggestions, but I can say that my favorite tourist postcards fall into two categories – iconic or quirky. The salt postcard appeals to me so much because it falls into both categories.